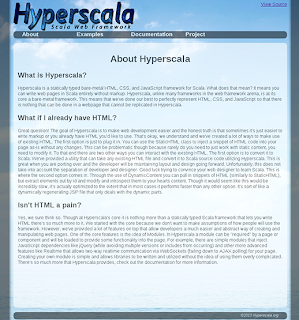 The site is incredibly basic right now and not all that pretty but it is written in 100% Hyperscala and has links to the source code on Github on every page along with working examples. Feel free to ping me if you have any problems with the site or something is missing that would help make the site better. @Sebastian, sure, I actually started out working like that but ultimately realized enforcing such practices hindered extension and encapsulation. Regarding static-site generation that's incredibly easy in Hyperscala. You can call the "outputString" method on any tag and it will convert the entire structure into an HTML String.